Phaselis is an ancient city located on an eastward facing shore of Lycia. It is about 27 mi. [44 km.] south southwest of Antalya (ancient Attalia). This city was founded about 690 B.C. 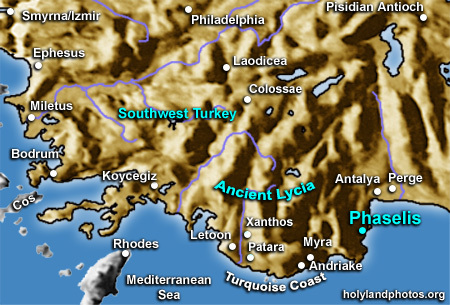 Because of its three harbors, and the lack of other quality ports in the area, it served as a major stopping point for ships that were sailing along the northern shore of the Mediterranean Sea. It was engaged in trade throughout the eastern end of the Mediterranean Sea and even, along with eight other cities, founded the trading colony of Naucratis in the Nile Delta (in Egypt).